Using low VOC (volatile organic compound) paints - as shown here at St. Stephen's Cathedral in Harrisburg, Pennsylvania, is one way to improve your building's indoor air quality. To learn more about St. Stephen's, click here. At first glance, the topic of indoor air quality may seem insignificant. But when we realize that, according to the US EPA, the average US citizen spends 90% of his or her time indoors, we see that indoor air quality can have a greater health impact on many people than outdoor air quality. This section of the LEED standards addresses this reality – and seeks to create the healthiest indoor environment as possible. The LEED standards for indoor air quality are based not only upon requirements of government as regulation, but also on best practices as defined by a range of professional associations -- from HVAC professionals to contractors to carpet manufacturers. First, have you established what your goals are for the indoor air quality of your building? Only then can you evaluate the steps you'll be taking to achieve them. Next, how will you handle the public health hazard of environmental tobacco smoke? Will you ban completely smoking in your building, and place any outdoor designated smoking area sufficiently away from your building entrances? Or, will you allow smoking in certain indoor areas, protecting everyone in your building by framing that space to be impermeable and venting it directly to the outside? To provide for people's comfort and well-being, will you install air quality monitoring devices for carbon dioxide which will tell you how well your building is ventilated with fresh air? You can also think about ventilating your building even more thoroughly, while still balancing the desire to reduce energy costs, by considering such strategies as heat recapturing. Have you developed a plan to reduce indoor air quality problems during the construction or renovation process due to the use of certain chemicals or materials that could impact construction workers or occupants (in the case of a renovation)? This same line of questioning extends to the phase of your project when construction is nearly completed but your building is not yet formally occupied. Have you planned for pre-occupancy steps such as an indoor air "flush out,” so that people move into a healthy building? Here are the things you want to measure and look out for: formaldehyde, particulates, volatile organic compounds (VOCs), PCH (phenylcyclohexene) and carbon monoxide. These chemicals and others can trigger asthma attacks, cause headaches for occupants, and more. 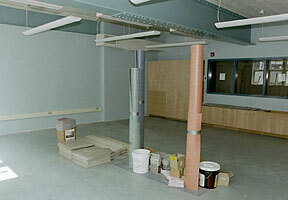 The materials and construction processes used in your building will have a major impact on indoor air quality. To minimize volatile organic compounds, you--and your architect and general contractor-- need to think about the paints, rugs and carpets, and adhesives and sealers your various sub-contractors and installers use. Also, the LEED standards reward buildings whose composite wood and agrifiber products (like particle board, fiber board and plywood) do not contain urea-formaldehyde resins, which worsen indoor air quality. To keep the air inside your building healthy on an ongoing basis, you may want to design your entrances so that people bring as few pollutants as possible into the building by having well-designed areas for people to remove dust and other particles from their shoes. You may also want to design, build and ventilate such spaces as garages, housekeeping/maintenance areas, and copy/printing rooms to safeguard indoor air quality. For the comfort and productivity of the people using your building, LEED encourages you to consider these aspects of indoor environmental quality: How to give as many people as possible the ability to control their own lighting and control the heat in their area; and how to provide as many people as possible with as much natural daylight as possible by which to read and work, as well as a direct line of sight to the outside world. LEED awards "bonus points" for projects that exceed the LEED standards in exceptional ways, or that demonstrate innovations in green design and construction that can be of benefit to others in the future. Consult the LEED standards at USGBC's website for details. Remember that no building is able to meet every LEED standard. The purpose of these standards is to provide a range of opportunities for building owners to green their facilities. How you approach these standards, and which you choose to employ, should reflect your particular situation (including such things as your location, program, budget, etc.). Finally, remember that whether or not you wish to apply for LEED certification (being mindful that some organizations feel that recognition by LEED has high value while others do not), the earlier you make decisions and commitments about which LEED standards you plan to meet the more likely, easier and less expensive realizing those standards will be.